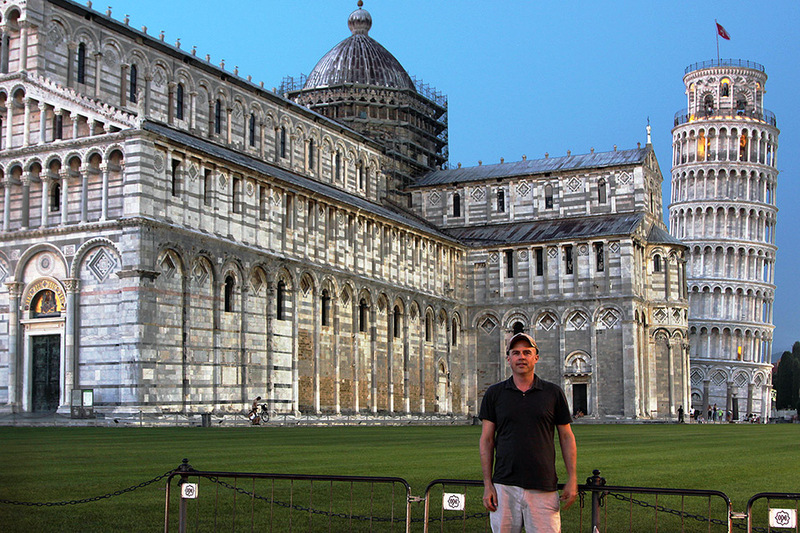 Pisa, Italy travel photos — Hey Brian? I wake in the morning, sad to leave. 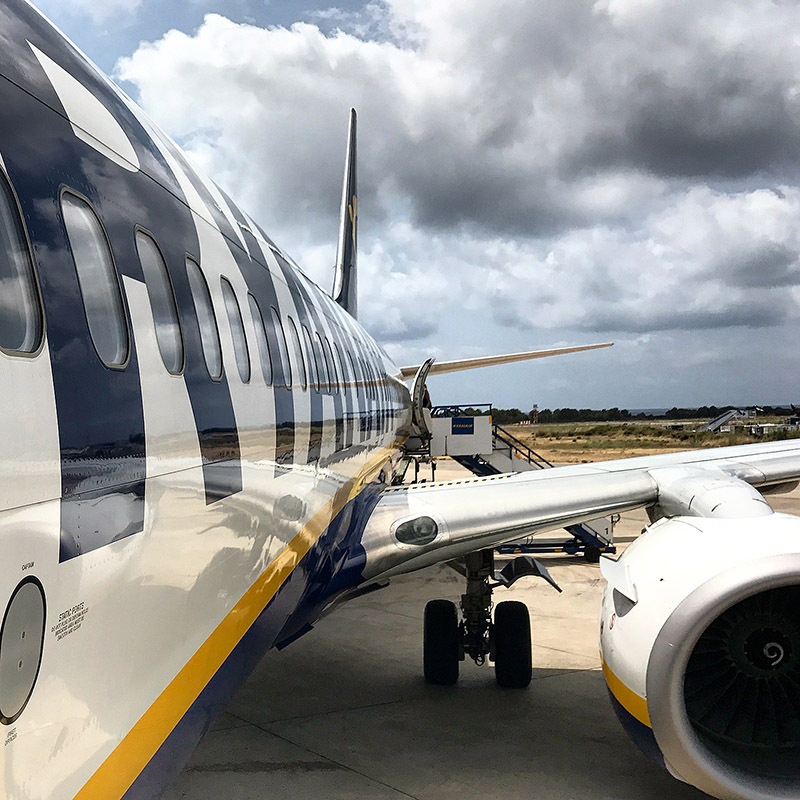 I Uber to Ibiza Airport and board Ryanair 8875 to Pisa, Italy. We fly over the north side of mountainous Corsica. In the distance I see Sardinia. We land in PSA Aeroporto Galileo di Pisa around 3:15pm and take a taxi to NH Pisa. 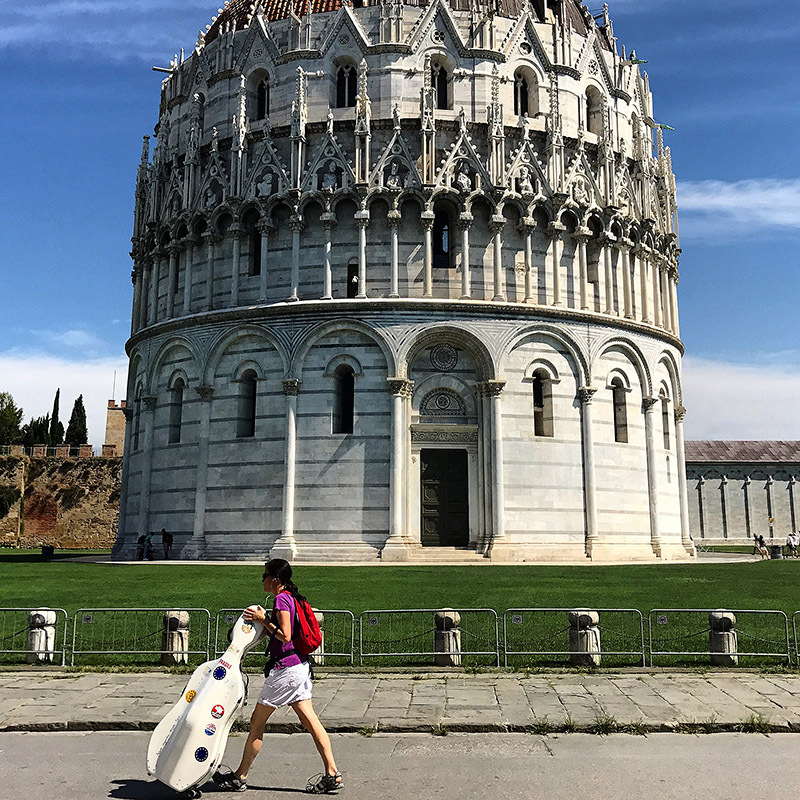 I grab a freshly-slide mortadella sandwich and take an afternoon walk over the Arno river and along Via Santa Maria, the main shopping street of Pisa. 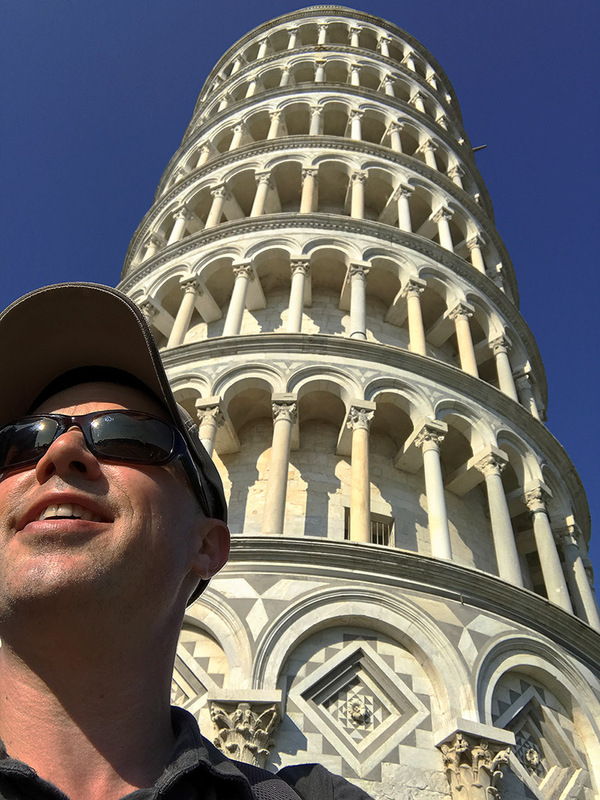 I arrive at Piazza dei Miracoli and finally see the Leaning Tower of Pisa with my own eyes; a long-awaited goal is realized. I get a reservation to climb the tower for the sunset. 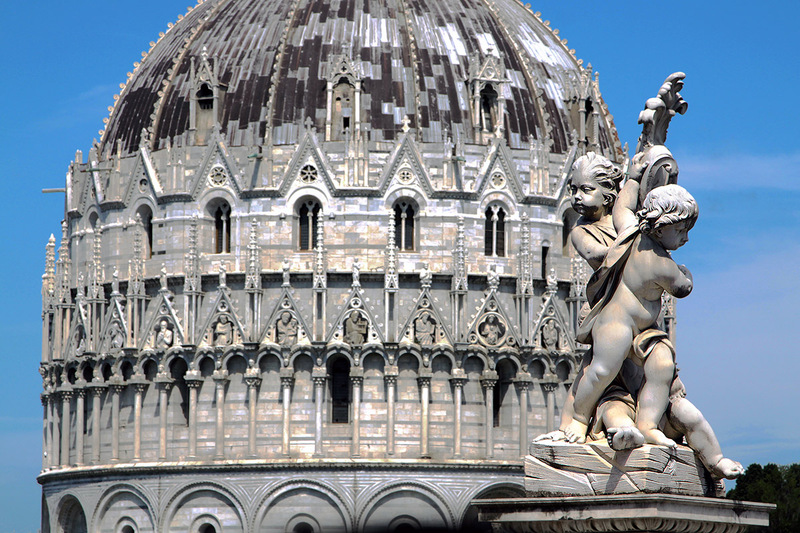 In the meantime I visit the Campo Santo cemetery, the Pisa Baptistry and the Pisa Cathedral. After my walk I sit on the grass in the shadow of the tower and gaze on the Torre di Pisa for 20 minutes until my reservation time comes. I climb the tower and visit each level, walk around and go up to the next level, until I arrive to the top. I can't help to notice how much the tower is leaning and now at the top I pray this thing doesn't fall. I figure the odds are in my favor. The view is amazing as the sun sets and the whole town turn a golden-orange hue. 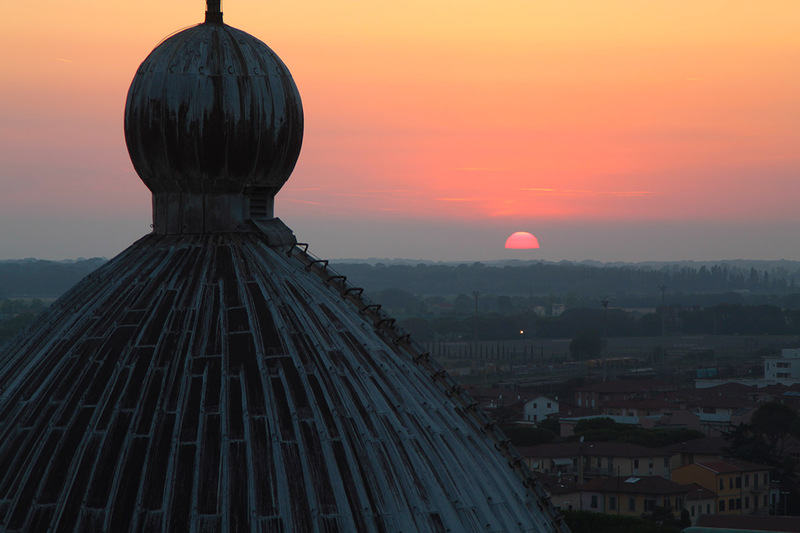 The terracotta rooftops of the surround town compliment the setting sun perfectly. 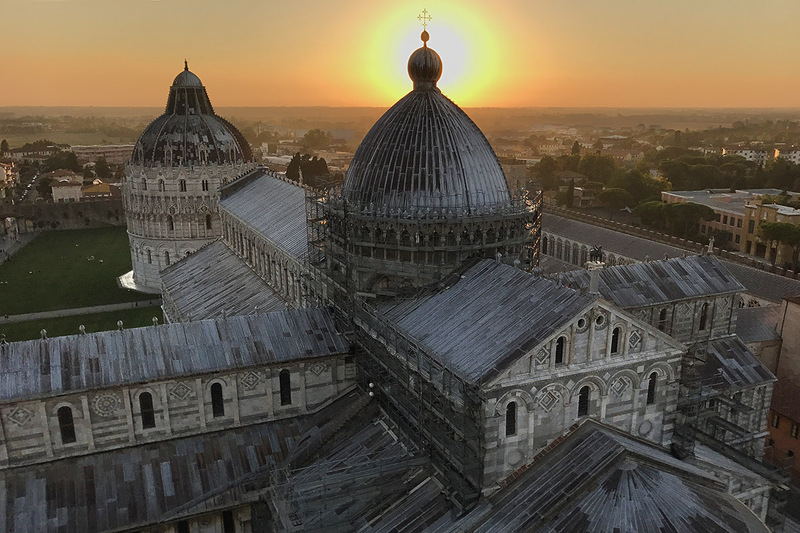 The silhouette of the Pisa Cathedral with the setting sun behind causes my Canon camera to come alive; I add at least 80 actuations to the body's shutter count. It is a masterpiece. After sunset I exit the tower and walk around the grounds more. I notice many of the tourists have left and it is quite peaceful. 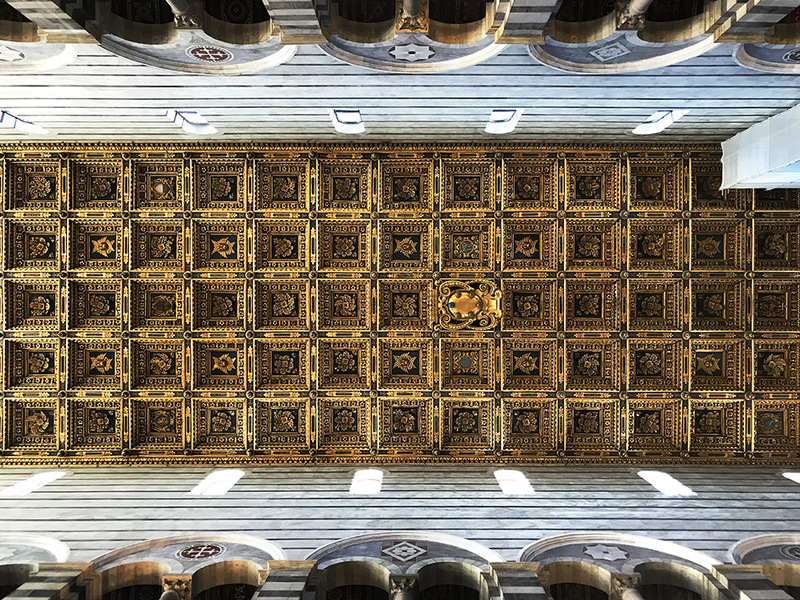 This is definitely one of the finest architectural complexes in the world. I head back to the hotel and crash, fully satisfied. I take a simple breakfast at hotel. I walk over the Arno river and back into historic Pisa. I take a different route than the night before aiming to stay more on the intriguing but run-down side streets. I end up back at the Piazza dei Miracoli. It's midday now and the high sun bleaches the contrast and saturated color I enjoyed the evening before. I walk back to the hotel, taking yet another different route. I shower, check out and order a taxi to Hertz. I realize I left my vital phone charger in the room so I ask the taxi to turn around back to the hotel. I run into the hotel but realize I left all my bags in the taxi; he could take off with all my stuff. I experience a brief moment of anxiety and hope for the best. I find my charger, return outside and, to my luck, my taxi and belongings are still there. We drive to Hertz and I take my upgraded rental, a beautiful black Infinity QX30 crossover. I turn the "avoid highways" setting on iPhone, plug in directions to San Gimignano, and drive into Tuscan countryside. I am in bliss. My only issue is I have such a nice larger car and I am riding solo; it's always fun to share the experiences with someone else. As I drive along the country road fields of sunflower in full bloom pass by each side of the rode. I pull over several times and snap pics but no digital camera can capture the full scale and intensity of the sunflower fields. When I arrive to San Gimignano I notice three girls in their mid-20s holding a hand-written sign simply saying "Need a ride to Siena." All three girls are in tank tops and wearing faded cut-off jeans. I am tempted to skip San Gimignano and take them to Siena, which is my ultimate destination for the evening. Nonetheless I drive by them, park and visit San Gimignano. I take a brief walk around the ancient village. It is legendary. Ancient sun-faded brick buildings surround ancient brick streets. The bricks are in different shades of rust, tan and orange. 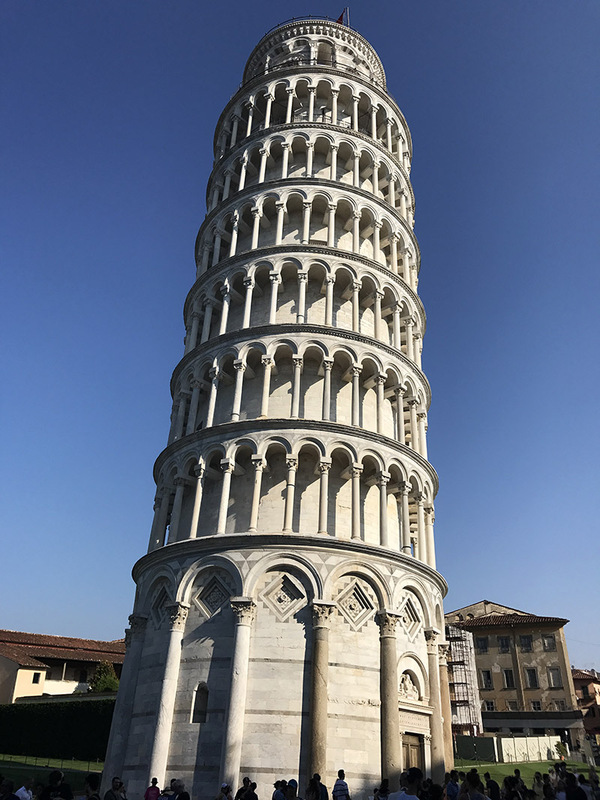 There are many tall brick towers, most with uneasy leans; I learn that Pisa does not have the only leaning tower in Italy. After a 30-minute walk I head back to my car and drive away. To my surprise, the hitchhiking girls are still there. Has no one picked them up? I pull over, let them know I am headed to Siena. There is an odd 15-second pause where they assess if I am safe and assess if they if they are not psycho. What if these girls are part of an Eastern European organized crime syndicate luring naive tourist into a black-market organ harvesting scheme? Eventually we all realize all is good and they pile in. Turns out they are from Holland, Poland and Austria, and like me are touring Italy for a week or so. We chat a bit as I drive and then we all stare outward and take in the gorgeous late-afternoon Tuscan countryside rolling by. I eventually drop off the girls at their hostel and drive into historic Siena to the Palazzo Ravizza. The hotel is majestic in its own right and steeped in history. The building was originally built for an aristocrat family some 200 years ago but now it is a hotel. A neglected antique black Steinway piano sits on the second floor tempting any passerby musician to sit and play. I fall for the bait and spend time with the majestic instrument for at least 20 minutes. My room has a high ceiling, tiled floor and a large vertical rectangular window that reveals a view of the street life below. A less-important cathedral sits across the street, but by American standards it is still grand. I change into evening clothes and take a walk around Siena. I am suddenly mesmerizes. I feel I am having my first real Italian experience. The winding cobblestone streets are surrounded by Italian villas on both sides. Some of the windows on the upper floor are open and others are shaded by vented metal shutters that can be opened sideways or from the bottom, and even at an angle, halfway up the shutter. This smart setup provides maximum viewing from the room inside while offering privacy from windows above. Cafes line the streets with outside dining all packed with patrons. I walk for hours thoroughly exploring every side street until, by chance, I arrive to Piazza del Campo, the massive and perfectly shaped central square of Siena. 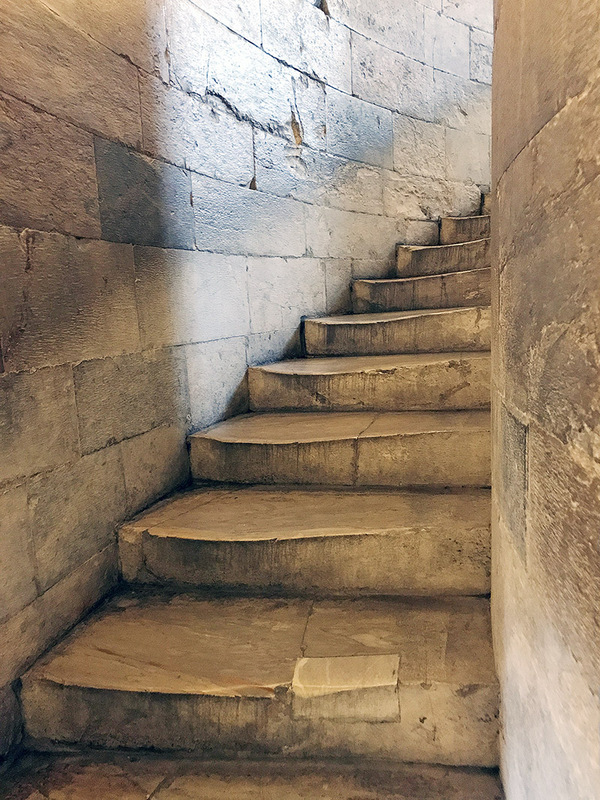 It is not really a square at all, rather a half-moon shaped space with a downward slanted brick floor that ends at the Palazzo Pubblico and Torre del Mangia. At the top end of slanted floor, cafes line from one side all the way to other, each with outdoor seating, all filled with hungry customers. Everything together is an architectural masterpiece; the feng shui is perfect. I get goosebumps. I later learn this is regarded as one of Europe's greatest medieval squares. Being night means there are less tourists. Folks are strewn randomly along the ground of the square, engaged in conversation and taking it all in. Some are laying down looking at the night sky and others share wine and snacks. An occasional tout flings a neon souvenir 100 feet into the air and waits while it spins down. I too sit down somewhere in the middle of the square and take it all in. A slight breeze whizzes by. This is perhaps one of the most beautiful human-made places I have ever been. I am totally thrilled and totally alone yet I feel at one with everyone around me. After 30 minutes, totally fulfilled, I head back to the hotel and fall asleep. What a superb day, to say the least! I wake in the morning and have a fantasic breakfast with a Tuscan view at my hotel. Fresh fruit, locally cured meat and small-batch cheese are in store, paired with the mandatory morning cappuccino. I take a final walk through Siena; I am going to miss this place. My goal for the day is to drive the Val d'Orcia, a World Heritage site, and visit Tuscan villages on the way, some of which are their own seperate World Heritage sites. I load Buonconvento into Google maps, turn on the Avoid Highways setting, and on the advice of my hotel begin driving down the SP46 road. The SP46 road is a narrow (barely) two-lane road the winds and turns along the southern Tuscan landscape. Being fall, the land is arid and the vegetation has died for the year, giving the rolling hills a golden hue. I would love to be here in Spring when the fields and hills are green. SP46 winds along until it turns into SP23, then SP33, then 34S and then Buonconvento rolls into view. It is a quaint, inviting town with ample parking. I pull over, pay the parking toll and walk around the old town for 20 minutes. The ancient buildings are made of brick that has been bleached by eons of the long Tuscany summers. I next head to Montalcino and as I get close the views of the hill village become impressive. I manage to park in the old town and take a walk around, eager to learn about its famed Brunello di Montalcino red wine. I step into the La Fortezza di Montalcino wine bar and try a flight of the local red wine. I wish I could spend the night and try more flights, but I have many hours ahead behind the wheel. Next time hopefully. I head down the road and in 30 minutes I am in Pienza. I park and walk around town until I find the Pienza Cathedral. I take a look inside the 500-year old building. I find a small deli that has a variety of cheese. I try the local pecorino di pienza and marvel at its dry yet subtly complex taste. I buy a hunk. I also buy a porchetta sandwich on local bread. The server literally cuts the porchetta from the carcass. The meat is spiced with local herbs and is as tender as tofu. I want to spend the night here as well but I need to continue. I drive by Montepulciano but am running short on time so I continue on to the north-east. I leave Tuscany and enter Umbria. I drive by a river and the gorgeous multicolor hill village of Città di Castello comes into view. I would love to stop here as well and spend some time but I need to keep moving. I make a note to definitely come back to Umbria. I enter the region of Marche and the landscape begins to change from rolling hills to the mountains of the Apennines. The SP257 road becomes quite windy and dangerous. Motorcycles and RV are zooming by in the opposite lane. The road narrows; if anyone makes a slight mistake on the curves it's game over. At one point I come to a roadside cafe and bar. Italian versions of bikers are hanging out enjoying the afternoon sun and clean air. I walk inside and order a ham sandwich. The server slices the ham from the carcass. The sandwich hits the spot. I drive again and the mountains finally mellow near Piobbico. I cross a bridge over a dry river, make an immediate right and park next to the river banks. I stretch for a moment and continue. In the small community of Ca' Romano I, I make a sharm and random left turn down a single lane country road, whose name eludes me, and drive faithfully according to my Google map directions. I am truly lost on the back roads of Italy now. The patchy road winds and bends. At one point I pull over and take a photo to prove my remoteness. After 20 minutes I merge onto SP55. From here I navigate many more back roads and roundabouts until I finally pull into the parking lot of Hotel Mamiani. My room is on the fourth floor and overlooks the Marche countryside. It is an absolutely gorgeous view with a perfect sunset. I am burnt from the long day driving and touring and I could spend hours just sitting at this window staring into the distance. But instead of chilling, I decide to head into the historic center of Urbino for a night wander. There are no tourists here, just locals and I almost have the place to myself. I pull up a chair at the Caffe Basili and have a lasagna, salad and beer. What a day — four World Heritage sites in one day, a personal record. Visit Urbino. 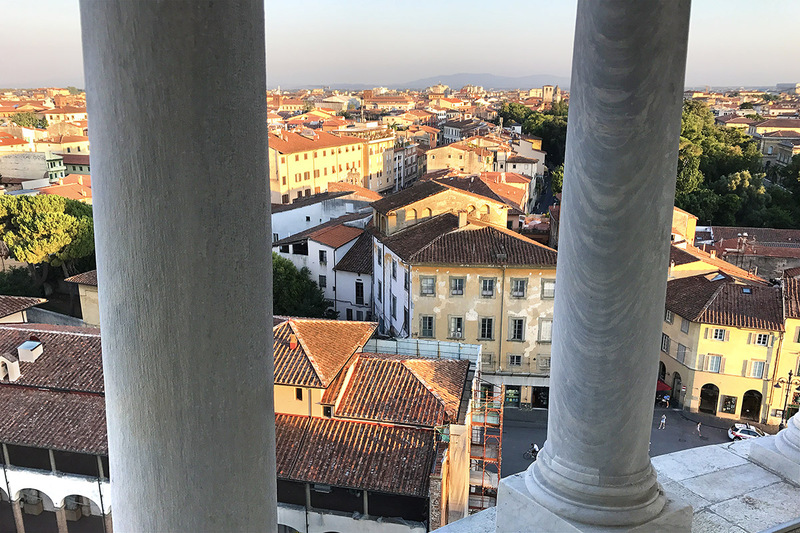 I tour the Palazzo Ducale and the Galleria Nazionale delle Marche, housed inside. The paintings are grand, the palace is regal and above all I become quite envious of the oversized fireplaces found in several of the rooms. Art highlights include La Muta by Raphael and Flagellation by Piero della Francesca. For lunch I visit Ristorante la Fornarina. The restaurant is tucked-away in an ancient building with brick arched ceilings and walls. The space was a stable in another lifetime. I order rabbit, thinking it would be a stew, so I am surprised when the rabbit arrives in a 'fried-chicken' manner with a leg, breast, etc. The rabbit is stuffed with fennel offal stuffing. I paired with a house red wine and a green salad. After lunch I drive to the Republic of San Marino. I tour the historic center, hike around the Three Towers, and visit the Museo Delle Cere. After two hours I drive to Venice. I check into Hotel Mercure Venezia Marghera. I throw my clothes into the complimentary laundry. It is 10pm and I weight the idea to drive to Venice and explore versus taking it easy. I decide to explore and drive my rental car to the Autorimessa Comunale parking garge near Piazzale Roma in Venice. I exit the garage and have no idea where to go so I ask a passerby, "Where is Venice." He points to the left and says, "Here." I wander left a bit and suddenly see my first real arched Venetian bridge. It's a smaller pedestrian bridge and I walk over it immediately, go back and walk over it again. I am thrilled. I keep walking into the dark maze of alleys of Venice. The alleys are dark and constantly turn, it's quite erie. I ask a passerby if it is safe here and they tell me Venice is safe at all hours. I wander for hours, my only goal is to get lost. I find the Ponte dell'Accademia bridge and walk over and back again and eventually end up at the Basilica di Santa Maria della Salute. No one is in sight at the massive basillica and it is quite erie out so I turn around and head back. I end up at the Campo Santa Margherita city square and find many cafes that are still open. Although it looks like a bit of a tourist trap, I sit outside at Pier Dickens and order the marinated sardines with onions and vinegar and pasta al pesto for €30. I definitely misorder. Considering how hungry I am, and considering this is Italy, the dish is quite subpar. The pesto tastes slighly toasted, even burnt. I still eat the entire dish. I realize I should have ordered pizza there. I head back to the parking garage, navigate down the circular ramp down 10 flights of stairs, pay €15 for after 10pm parking and head back to the hotel. After breakfast I take the 6 ACTV bus into Venice. I walk passed a store selling a beautiful Venetian glass vase with murrina millefiori. It looks like trade beads melted down, flattened into a sheet of glass, and then formed into a vase. I find a small bakery and buy a fresh sfogliatelle pastry that is made of layer after layer of thin crisp dough with sweet cream inside. It is delicious. I walk further and then stop at Majer Cafe Bakery and order a cappuccino, water and pastry and take five to relax and let my summer heat exhaustion subside. Two fellow gondoliers walk in for some and order some drinks. At another table, a group of Italians sit and play cards. I guess this is a locals spot. I continue to walk north into the Cannaregio sestiere to the Jewish ghetto. I am approached by a Chabad fellow who asks me to do tefillin. I accept and am soon wrapped up and saying prayers. I walk further exploring the alleyways and canals until I reach the end of the island. I then head east. By this time the sun is hot and I seek shade possible on my walk. 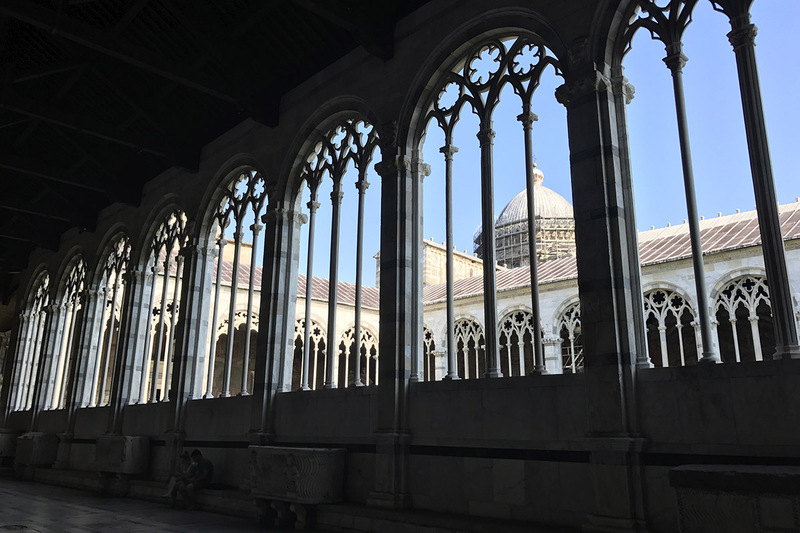 I walk south into San Marco and begin to see many tourists, all as mesmoirzed by the sites and sounds as me. Occasionally folks walk by wheeling luggage. I figure they are independently navigating to their hotels rather than pay the exhorbitant prices for a water taxi. I do not blame them (and little do I realize I will be in this same predicament a few months in the future.) I buy some truffle mortadella and bread from a deli and sat next to a canal and eat some lunch. Many gondolla boats drift by. Dinner at Pizzeria Da Gianni for €27. I check out of the hotel and drive toward Bologna. On the way I stop in Padova and visit Orto botanico. This garden was founded in 1545 by the Venetian Republic and is the world's oldest academic botanical garden that is still in its original location. For this reason it is a World Heritage Site. Time is short for my car rental so I hurridly enjoy the gardens, run back to my car and continue on to Bologna. I need to fill the gas before I drop the car off at Hertz, but this proves a bit more difficult than hoped. For one, there are few station nearby. For seconds, there is no attendant to assist. The credit card machine is broken which leaves me tot he cash machine, which has a long line. I need to estimate the exact change to buy the right amount of gas. My first take of 10 euros is less than hoped for as the gas meter doesn't say full. I wait in line again, drop a five euro note in the machine and hope for thee best. At Hertz, the folks find some very minute ding under the front bumper, which isn't from me, but they seem to want to blame it on me. Luckily they drop the issue. I take a taxi to the Art Hotel Commercianti and check in. I take a long walk around the old city of Bologna. The alleyways and architecture is fantastic. There are shops and cafes everywyere. I sit in a squate and enjoy an Aperol spritz. 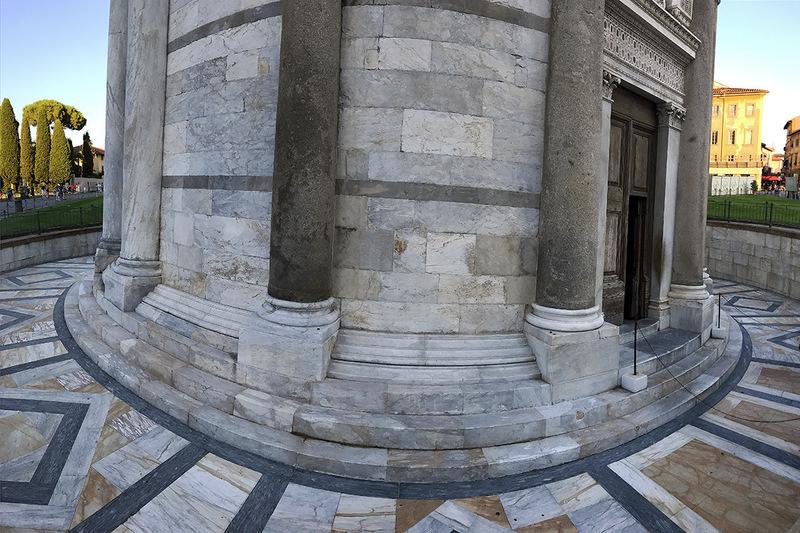 On the cathedral front, I visit Basilica di San Petronio and the Basilica di Santa Maria; both are worth it. I manage to find the tourist office and reserve a time to climb the Asinelli Tower. Atop the tower are great views in every direction over Bologna. 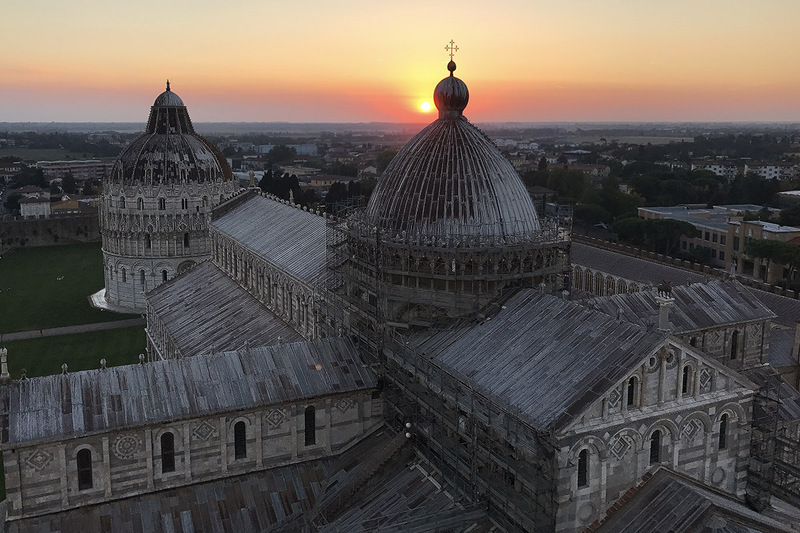 I am a little afraid of heights, and this slightly leaning tower does not help much, but the climb and view are worth it. For dinner I eat outside at Trattoria Osteria Buca Manzoni. I order the spuma di mortadella con crostini di pane (mortadella mousse with croutons) and lasagna verde alla bolognese (green bolognese lasagna). I pair with a red wine. After dinner I find game-changing gelato at Cremeria Funivia. There is a line when I arrive, but I only hear Italian spoken, so this, combined with the fact this place is slightly out of the way, is a good sign. My first flavor watermelon is by far the best watermelon ice cream, sorbet, or whatever else you want to call it, I have ever enjoyed. The name of the other flavor eludes me because the flavor caption is in Italian, but it is a mix of orange cream with bits of soft cookie. Not bad for €2.50. If you are in Bologna, do not miss this place. I think I am ruinted for life on the gelato front as nothing will ever compare. I almost get in line a second time but regrettfully my will power wins. I take a long walk around the old town. I pass many cafes and bars, all are hopping and full of people merrymaking. I head back to Piazza Maggiore where an open-air movie is playing. I take an open seat and watch for a bit. The movie is in Italian so I leave after a few minutes and grab a drink outside at 051 Zerocinquantuno. I have a nice breakfast at the hotel. I wander around town and stop by 051 Zerocinquantello and order tortellini con ragù alla bolognese. Tortellini comes from Bologna so I am excited to try it at the source. After lunch I hop in a taxi to BLQ Bologna Guglielmo Marconi Airport. I board flight SAS 2684 and take off at 2:30pm for Copenhagen.